Above, my favorite V3 26 inch, that started as basic black synthetic but had "Fatal Flight" camo applied by Black Ice Coatings. My comment was met with large eye-rolls and laughs. Oh no, no clays were involved, this was just grunt work-- shoot, shoot, shoot . . . at no targets. The team was bored, who wouldn't be, for aside from shooting at each other's wads from time to time, it was just making hulls, and a lot of them. I've shot dozens of Remington V3 synthetic models, here in Illinois, in Texas, in Oklahoma, and in Arkansas. And, I personally have had zero problems. However, after the V3 synthetic models were out in quantity for nine months or so, there were a few reports of “Blowback” . . . apparently meaning gas in the face. WHERE COULD BLOWBACK COME FROM? There are three areas of interest: the ejection port, the gas block, and the compensating valve exhaust. Any side-ejecting autoloader will expel gas through the ejection port, including inertia guns and other recoil-operated guns. It has at least the potential to be annoying, but that's all side-ejecting autoloaders. The V3 synthetic has a vented gas block attached to the barrel. There is potential that some gas can come from it, after all it is vented. The gas-compensating plugs were designed to exhaust gas. They work extremely well, there are just springed pins, but the gas is hotter and cleaner from a V3. When Remington did their R&D work on the walnut V3, they found that the standard V3 synthetic system cracked walnut forearms. That delayed the release of the walnut V3 by at least a year. Using pressure transducers inside the forearms, they measured the exhaust gas pressures. To solve the forearm cracking issues, Remington went to a non-vented gas block and long exhaust tubes for the walnut model. This was all done to eliminate forearm cracking, for blowback was not a concern. Now, the confusion begins. Some folks bought synthetic V3's assuming they could just add a walnut stock later on. Assuming often isn't good, for if you do you can expect forearm cracking. You can, however, add a synthetic stock set to the walnut model with no issues. The latest release from Remington is the V3 Compact Synthetic: 22 inch barrel, stock spacers, and adjustment shims for drop and cast are included. As far as I know, the V3 Compact has a non-vented gas block, but still has the compensating valves. I have requested a V3 Compact, I'll go through it just as soon as I get my hands on one. V3 Gen1 System: for synthetic stocks only, vented gas blocks, compensating valve exhaust. V3 Gen2 System: supplied on all walnut models, non-vented gas block and exhaust tubes. V3 Compact Synthetic System: non-vented gas block, Gen1 compensating valve exhaust. Going forward, my understanding is that all V3 models will have non-vented gas blocks. Eventually, I do not know when, all V3 models will likely be shipped with Gen2 Systems as supplied on the walnut from the beginning. One owner writes, “The gas blowback is such a non-problem. Just use 2 strips of electrical tape inside the hand guard and it completely disappears. I have a V3 and love the gun...reliable and light shooting.” I have not seen, much less fired the V3 being referred to. However, the electrical tape would address the vented gas block only. Vented gas blocks apparently are no longer being used by Remington. Remington has introduced an 18-1/2 inch barrel for the V3. 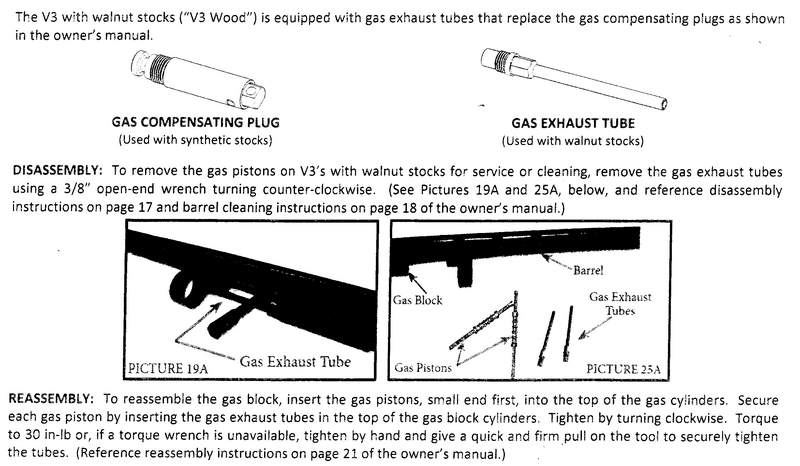 In both of these cases, the barrel used does not have a vented gas block or any exhaust tubes or compensating valves, they are solid plugs. Remington explains, "These barrels actually have solid gas plugs. It has no addition pressure compensation or the exhaust feature. Just when you think you have it all figure out we gave you something different. The 18.5” barrel is configured to work primarily with tactical and home defense loads including managed recoil buckshot. The new TAC-13 utilizes the solid gas system plugs as well. Solid plugs can be used interchangeably with on the other gas blocks but they will obviously run the action faster." Two years ago, a complete fix was not just designed and tested, it was in full, regular production. To ship V3's with only a partial fix is irritating. It creates a pile of morphodite V3's. There is only one reasonable answer to the vented gas block: it was a major design screw-up, something never, ever needed that was added anyway. Two long years ago, every V3 shipped could have been shipped with same barrels as used on the walnut V3's. No one would ever have had to complain about blowback from that point onward, You can believe this is a major-league management screw-up. Someone decided that, rather than do things the right way (that they knew about 2-1/2 years ago) they were going to try to use up all of their substandard barrel inventory and continue to manufacture substandard barrels because they already had a pile of vented gas blocks and compensating valves in inventory. Now, they have apparently used up most of their vented gas blocks. But, they still have a pile of compensating plugs in inventory, so they are going to keep making barrels with them until they run out. Having exhausted all other options, Remington will eventually do the right thing.